If you are looking for a fun and exciting way to elevate your celebration, hiring a special effects company is the best way to do so! Rythm EFX can help coordinate a digital display on our LED video walls. With our help, we can take any gathering, such as a corporate party, a church event, and even a wedding, and turn it into a party. Together, you and our designers can come up with incredible visual effects to help boost the interactive experience of your party. Everyone knows that a party is made by the people who gather together. However, the best way to elevate a party is by adding fun activities and visual stimuli for those people to experience. Taking a typical party and adding lights, fog, bubbles, and visual effects will always be able to excite and inspire your guests. 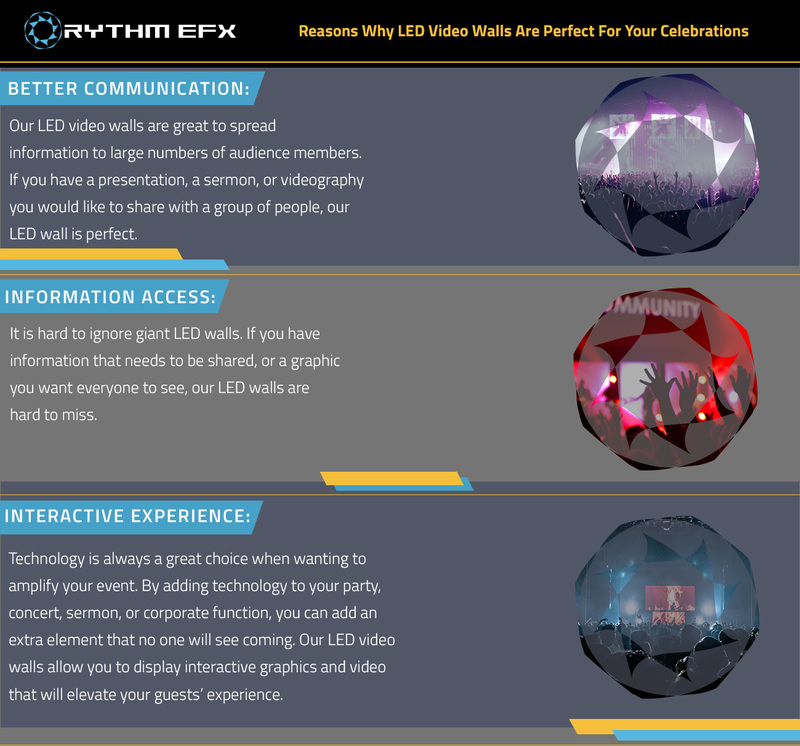 Whether you are planning a church event, a corporate function, or a wedding, Rythm EFX has something to offer your celebration. One of our most popular elements of light and digital design is our LED Video Walls. These towering LED light screens can visibly display anything. From video streaming, to presentations, to even celebratory video displays, our LED video walls can do it all. There are many benefits to this type of display, but in this blog, we will give you the three main benefits. It will come as no surprise that our massive LED walls can be a benefit in terms of communication. People naturally gravitate to its display, and it is the easiest way to communicate with a large group of people. Often, in large gatherings, people will rely on a microphone systems to communicate with their guests. Though microphones are useful, they also can cause interference and shrieking. Instead, you can rely on our digital wall to help relay important information to your guests. Not only will you be able to spread your interesting information and graphics to a larger audience, but you will be able to impress them with the technology you have utilized. A giant panel of LED walls is hard to ignore. If you have a message you want people to hear or a videographic you would like to share, displaying it on our LED walls is the best way to do so. If you have information that must be shared, having large walls display it is ideal. Our LED walls will allow you to show any video or creative graphic you would like, both indoors or outdoors. That’s right, our LEd walls are weather resistant. Thanks to this lovely feature, our LED walls can be set up both inside or outside. So, don’t worry about the weather — we got you covered! Our LED video walls allow for an alternate interactive experience. Instead of seeing a message on a regular jumbotron, our walls can be set up to provide an artistic way to display art, music, and information. Not only are our LED video walls “cool-looking” but they are also a unique way to incorporate technology into your event. One of the best (and easiest) ways to impress your guests is by utilizing technology to enhance your guests’ experience. No one will be anticipating such an artistic and unique way of displaying information. If you are interested in renting our LED video walls, we have them available to rent! We can help you set up the technology and make sure everything is running smoothly before your guests arrive. That way, when the time comes, the video walls are displays that are sure not to disappoint. Contact us today if you are interested in this incredible piece of technology.